Inventory We are a resale marketplace, not a box office or venue. Ticket prices may exceed face value. This site is not owned by Palace Theater Columbus . Palace Theatre Columbus operand in 1926 and has been one of the premier venues to catch your favorite performing arts, concerts, and speakers. Palace Theatre box office is located on 34 West Broad Street in downtown Columbus, Ohio. The seating capacity is 2,827 for any show. The Palace Theatre was rebuilt and renovated in 1989 from its capacity earlier as primarily a place to watch movies. 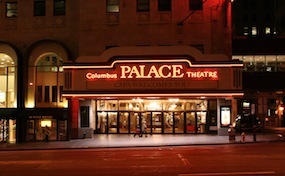 The most popular Palace Theater Columbus tickets are mainly for the Broadway Across America events that pass through the area. The Palace Theatre is known for its wonderful acoustics, grand staircase, chandelier, and fountain. Palace.TheaterColumbus.com is not affiliated with any primary box office, supplier, or official website. We are a privately owned and operated company that specializes in all online sales in the secondary tickets market. All of our inventory may be priced above or below face value and prices can change rapidly depending upon the current market. To order tickets to all Palace Theatre Columbus events simply call our operators at anytime or follow the easy to navigate steps online by choosing your event of interest and inputting your information in the secure checkout.